In the world today, walkie-talkies are very important tools. From security services, construction sites, camping sites to use during emergency rescue missions, they are a vital part of the communication industry. In the past, walkie-talkie users walked around talking and listening directly from the big phonesâ but with the advancement of technology, walkie-talkie accessories have made it possible to seamlessly communicate using earpieces and headphones connected to the walkie-talkie while it remains strapped to the belt. At EarpieceOnline we have a wide range of top quality walkie-talkie and radio accessories to help ease communication with workmates. EarpieceOnline.co.uk .co.uk, have the best earpieces both wireless and wired. These earpieces can be used together with all the leading 2 way Radio Brands like Motorola, Kenwood, Entel, Hytera and Icom. Their earpieces are very small, light and comfortable to wear. The small invisible earpieces will help provide clear and covert conversations. Your information is secure with these small masterpieces and no one will even realise that you are on radio communication. They also have different styles of earpieces available in store. With D shaped earpieces, C shaped earpieces, acoustic tube (2 wire and 3wire) and bone conductors. It is upon the customer to make the choice for the most appropriate earpiece suited for his/her needs. Here are some of the available earpiece types in the store; High quality 3 wire covert earpieces, earpieces adaptors, in ear moulds and mushroom replacements for acoustic tube earpieces. The 3 wire covert earpiece kits available in our store include; The Covert Motorola Block connector earpiece, Covert Motorola 2 Pin connector earpieces, The Covert Kenwood 2 Pin connector earpiece and Icom Multipin connector earpiece. These earpieces can be used with most of the leading Radio brands in the market. These acoustic tube earpieces are made from very durable materials with Kevlar cable reinforcement. The connecting wires to these connectors are long enough giving you freedom to walk around comfortably. They further have Noise reducing microphones, push to talk buttons and are all RoHS compliant. The features might slightly vary depending on the brand of earpiece you prefer. We also have wireless kits to further make your communications discrete and easier. These kits are very small, light and easy to use. The inductive pack of the kit is attached to the collar of a shirt or inside a jacket and it then transmits audio signals to the in-ear wireless earpiece. A small push to talk button is concealed in the userâs wrist where the user will be talking to. The available wireless kits in EarpieceOnline.co.uk include; Inductive wireless flat pack with its in-ear wireless earpiece and the Neck Loop Inductor Earpiece with an In âEar wireless receiver. All these earpieces come with well-designed mushroom replacements. Different radios have different connection ports. 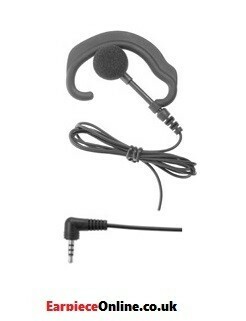 At EarpieceOnline.co.uk, they have a range of earpiece radio connectors to connect earpieces/headsets to all the leading radio brands like Motorola, Kenwood and Icom. Whereas other connectors are tailored to specific brands, some are universal and will be used to connect more than one 2 way radios. Some of the available connectors at EarpieceOnline.co.ukinclude; interchangeable universal connectors- this connectors allow you to interchange between different radios like the Motorola GP340, GP344, GP360, DP3400, DP2400, all Icom, Hytera and Kenwood radios. We also have replacement connectors that are used to replace specific connectors. They include; DP2400 replacement connectors, Entel Multi-pin Connectors, GP340 Connectors and many other individual brands. Be sure to check with us for your desired connectors. EarpieceOnline.co.uk have a large team of experienced professionals to help you with choosing and buying 2 way radios and accessories. We sell high quality products which meet the required standards to satisfy our customers. Our prices are very affordable considering the durable and the quality of the products that we offer. Our customers enjoy very fast responses to queries and we deliver the purchased items quickly. Visit our online store at EarpieceOnline.co.uktoday and get high quality products to suit your business. If you are looking for the best 2 way radios, earpieces, connectors, adaptors and many other communication accessories then EarpieceOnline is your perfect spot to shop.